Some faults were so commonly known and understood back then that they were not mentioned in the standards but that does not mean we forgive such faults today. 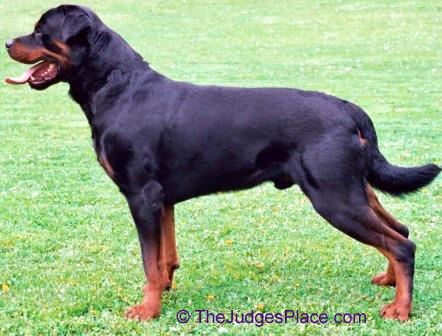 I received an interesting communication from a Rottweiler breeder-judge who made some interesting observations on the Rottweiler. I will share some extracts of our conversation because long tails in docked breeds are still an issue for many exhibitors. Here is the thrust of her first post. “(Your) tail article is good and all but Judges don't judge to the standard. A number one … best of breed winner … at Westminster … does not fit the written standard (She mentions several faults and continues) …Putting up a correct dog with a tail does not go against the standard, when the standard states: tail set is more important than length… This tail propaganda looks stupid, as the standard says so an so, yet dogs who don't fit the standard, get put up. “We are a docked breed only for the look. It served no purpose to dock (back in the day) except they preferred the look…Having a tail should not hinder a correct dog. It is sad that we are so far behind everyone else as far as excepting the tail. I also asked would a pure white Rottweiler “not hinder a correct dog”? It has correct structure, so it “should be judged and used.” You would be the first to raise your voice against the white Rottweiler. Reread the Standard – sickle hocked is not mentioned. Yet sickle hocks and herring guts are killing a majority of the breeds. Is it because it is not written in the Standard, or (because) breeders, exhibitor and judges do not recognize such major structural faults? Common faults should never be ignored. She replied “The color is clearly defined, Disqualifications--Any base color other than black; absence of all markings. …. Tail set has nothing to do with the structure of the tail. Tail set is determined by the croup angle. The tail set is defined in the breed standard. So far the only thing a natural tailed Rottweiler has not done is BIS. I just get upset that judges spew the tail propaganda (as if judging to the standard), and then put up dogs that don't fit the standard as it is written. One cannot just be against one part, but the whole standard. I did judge for 6 years, but gave it up to have fun with my dogs. I have forwarded your name to the list of judges who will not put up a tailed dog. I JUDGE IN ACCORDANCE WITH THE STANDARD, NOT IN ACCORDANCE WITH H$U$ OR PETA. Hoping we can all get over this silliness, and worry about more important things. I would like to have it noted that the Rottweiler has had a docked tail for centuries. 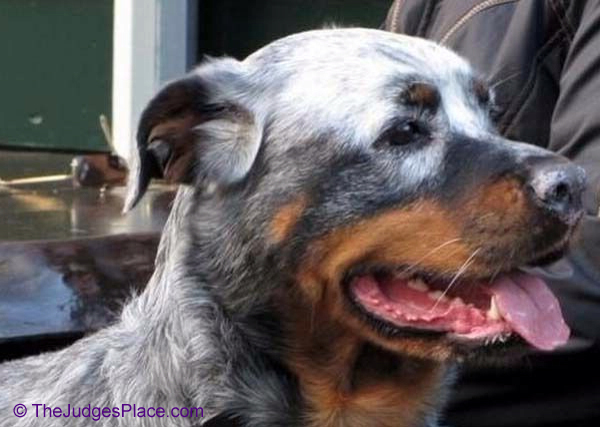 As a cattle dog he guarded the herd and the Herder. The “enemy” was the wolf and sometimes humans. A natural tail could be grabbed or injured while far afield and no veterinarian would be available. Breed survival was one purpose of docking. This also held true when they were adopted into Army and Police work. The Animal Rights agenda calls it “cosmetic surgery” but for the functional or working dog docking can be survival surgery.